The Finale of Tchaikovsky’s Fifth Symphony performed by the Boston Civic Symphony at Jordan Hall on Sunday March 7 thrilled—simply put, it was a spine-tingler all the way. Conductor Max Hobart encouraged a full symphonic orchestra of players representing a range of experience to play full-out at the right time, sweeping gestures at the right moment, dialogues with natural expressivity, and a terrific palette of color. When the trumpet fanfare of repeated notes started up, excitement at every turn of the music suspended belief. It is very rare for me to be carried away as I was with these musicians who should not at all be thought of as amateurs, semi-professionals, and the like, not at all. What conductor and his responsive orchestra accomplished was a stupendous couple of movements from the Fifth. And how refreshing it is to hear the Russian’s lyrical melodies that once heard can never be forgotten. I have known since grade school the beautifully flowing horn melody from the second movement marked Andante cantabile, and, in the hands of these keen and dedicated instrumentalists, it still rings as true today as it did then. Overall, this movement (also marked con alcuna licenza) verged on bewilderment. At times, performer confidence fluctuated. Also, some of the smaller compositional features, like those moves that weave larger parts together, seemed to be glazed over. It was actually the third movement when the orchestra completely took off. The Valse: Allegro moderato, a real favorite and one of most wonderful orchestral waltzes composed, danced and romanticized throughout. A few strange sounds from muted horns puzzled this listener’s ear but never distracted from the whole. Strings, winds, brasses and tympani all contributed to the “max” as they did in all the way to the end. This year, there has been a lot of Beethoven programmed around town. Programming seems to go in cycles: one year it is Mahler; another year it is Haydn and his symphonies. But I am hard pressed recalling the last time I heard a Tchaikovsky symphony here in Boston. So, another round of applause goes to the programmers for this selection—one that the small but entirely appreciative audience wildly embraced. No greater climactic close to a concert could have been achieved than this. This was, indeed, one of those rare and glorious musical moments. Boston-based violinist Irina Muresanu offered up a lovely performance of Paganini’s Cantabile for Violin and Orchestra (best known in its violin-piano version). Muresanu puts forward a sound and a style altogether sumptuous and smart. Had some of the expressive moves she so brilliantly shaped, taken just an ounce of spontaneity, her interpretation would have taken us over the top. Nevertheless, hers is an art very close to the top. The orchestra was the perfect accompanist. Rossini’s light and playful L’Italiana in Algiers Overture surprised with one of the strangest of all sounding cymbals I have heard. The sound was “culinary.” Here, as elsewhere in the program, oboist Andrew Price, clarinetist Kristian Baverstam, and bassoonist George Mueller were outstanding as soloists and when paired together, and they had a lot to do on this concert. 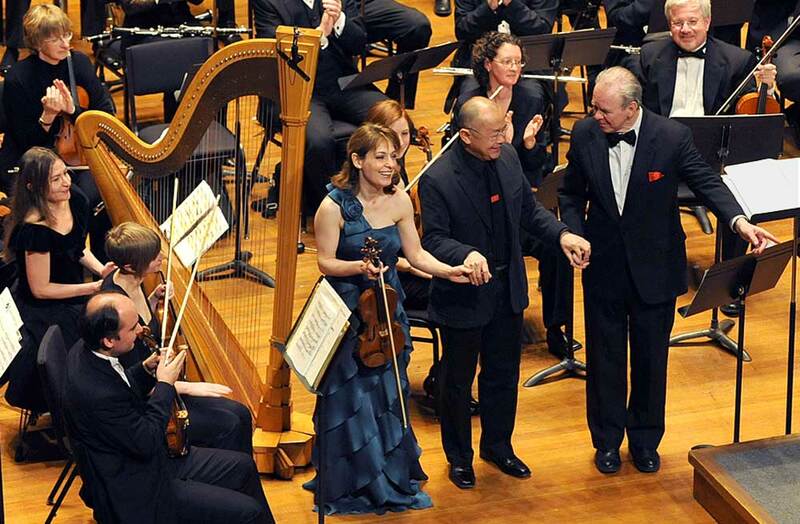 The Boston Civic Symphony gave the world premiere of Violin Concerto, op 129 (2009) composed for Irina Muresanu by Boston composer Thomas Oboe Lee. A hodge-podge, it lumbered through all-too familiar harmony after harmony, creating plateau after plateau of sameness. The music had little, if any, direction and lacked any hint of freshness. If there was anything redeeming about it, it was Muresanu’s virtuosity and sensitivity, though at one point in the second of two movements she seemed to have been forgotten by the composer for minutes on end. I’m not surprised that the Civic Symphony concert was so exciting!! Max Hobart – who also is the Music Director of the Wellesley Symphony Orchestra, of which I am President, is sensational. His programming is imaginative, yet stable, and he manages to weave orchestral works together so they make sense. As a violinist, he has an enormously positive effect on the string section. So, I say bravo to Max and bravo to you, Professor Patterson, for expressing your excitement over this concert so beautifully. As an amateur listener I was, too, enthralled by that last piece. What a joy it is to listen to live music when it is not your norm…I’m reminded of Dickinson’s poem about going to sea and what is a commonplace experience for some is the absolute innocence of new joy for others. I sat next to the spouse of one of the musicians – both she and her husband were music majors – and both she and her husband are employed in occupations that have nothing to do with music. It’s just the true story. So, for all these talented musicians and the wonderful conductor, I thank you for every hour of rehearsal and practice. You made my Sunday afternoon so good. Thanks for the lovely review. We in the orchestra enjoyed playing probably even more than you enjoyed listening. About the cymbals: Rossini did not specify instruments in the percussion line of the score, simply writing, “B.T.”, for “banda Turka”, or a group of Turkish instruments. To the extent that I could make out the Italian of the commentators–Italian is not even my mezzo forte–Rossini performed the piece with varying percussion instruments, including the “Mezzaluna”, or Turkish crescent, a sort of ornamented hatrack of little bells. Most often the overture is done with cymbals, triangle, and bass drum. We added a tambourine, for a little of the crinkly sound of the Mezzaluna–not an easy instrument to borrow. So if the whole effect was “culinary”, that’s about what we wanted! Mr.Horn, thank you for your thoughtful message that clarified your intent. I am aware that there are some dozen or more editions of the Rossini, all them different. You certainly did come up with a quite a sound! Max Hobart is an outstanding music director and musician in general. He has an incredible ear and always has the ability to make music, true music, with any group consisting of players from all different backgrounds and skill sets. I am a former cellist with Civic Symphony and I confess I currently play under Max’s direction at Wellesley Symphony, but I constantly enjoy his programs, his knowledge and insight of the music, and his approach to each piece. Bravo Civic and Bravo Max.